After advancing to the championship round last year and being stranded in New York by Hurricane Sandy, the Dos Pueblos High School Mock Trial Team has once again been selected to compete in the Empire City World Invitational Mock Trial Tournament to be held in New York City this October. The tournament, considered the most prestigious high school mock trial invitational tournament, brings 40 teams to the Big Apple from across the country and around the globe — including teams from the United Kingdom, Ireland, New Zealand, South Korea, Canada and Australia. This year’s tournament will be held Oct. 18-21 at the Federal Courthouse in downtown Brooklyn. In their first-ever appearance at Empire, last year’s team upset their bracket’s top seed and advanced to the championship round, losing a close match against La Reina High School from Ventura County on the day that Hurricane Sandy made landfall in New York. La Reina’s team followed their championship at Empire by winning their unprecedented third straight California championship — once again edging Dos Pueblos in a tough first-round matchup. DP’s Madeline Matthys won an individual award as the tournament’s outstanding defense attorney. In addition, Delia Bullock and Ami Thakrar won recognition for outstanding witness portrayal and outstanding clerk respectively. “The team is over-the-moon excited to be able to compete at Empire again this year,” said team co-captain Camille Wyss, who is a senior trial attorney. “Last year, not only did we have a fantastic time, it was the best competition we had had the opportunity to compete at. The atmosphere of the Empire competition — and New York City — is infectious, and we couldn’t be more excited to be a part of the action again. I can’t think of a better way to start my fourth and final year with the Dos Pueblos Mock Trial Team. The team is gearing up for a fundraising campaign to raise the necessary funds to travel to New York City for the tournament. The students will be holding a rummage sale in the Dos Pueblos High School staff parking lot from 8 a.m. to 2 p.m. Saturday, July 27. If you have items you wish to donate, please contact Delia Bullock at delia.m.bullock@gmail.com. Tax-deductible monetary donations can be made by sending a check payable to DPHS with the notation “Mock Trial” on the memo line c/o faculty advisor Bill Woodard, 7266 Alameda Ave., Goleta, CA 93117, or electronically by clicking here. Contact Woodard at bwoodard@dphs.org if you would like more information. The members of the Dos Pueblos Mock Trial Team who will be competing at Empire are Delia Bullock, Madeleine Centrella, Laila Halimi, Alissa Kruidenier, Bela Lafferty, Madeline Matthys, Camille Wyss, Ami Thakrar and Sophia Zheng. These students will now spend their summer preparing the fictional case of Midlands v. Dawson. In the case, Vanessa Sullivan, daughter of Midlands’ most prominent prosecutor, celebrated her 21st birthday with two friends, Taylor Hopson and Danny Dawson, at Chuggie’s Sports Bar. After several hours of celebration at the bar, the three left in a car driven by Dawson. On the way home, Dawson lost control of the car, resulting in a crash in which Sullivan was killed. A special prosecutor was appointed because of the conflict of interest in having the victim’s parent’s office prosecute the case. A grand jury has returned a multicount indictment charging the defendant, Danny Dawson, with murder and driving under the influence. DP Mock adds one more week of camp in August! Think you might be interested in Mock Trial? Want to learn skills that will help you try out for Mock Trial? DP Mock was just invited to compete in the high school world championship tournament to be held in NYC October, 2013. Proceeds from the camp will help fund the costs of the competition. What will DP MT Summer Camp involve? It will be run by our JV Mock Trial coach, Corinne Dorais, in conjunction with several of our returning team members. You will learn: how Mock Trial works, how to analyze a case, how to develop a witness’s character, what the coaches will be looking for in September when try-outs for the team are held, and more…This camp will be appropriate both for those who attended the June camp and for those who did not. We will be working on a new case. For more information, contact Corinne Dorais at Corinne.dorais@gmail.com. DP Mock Trial is one of the most prestigious (and fun) activities at DPHS. The team has won the county competition for the last five years. 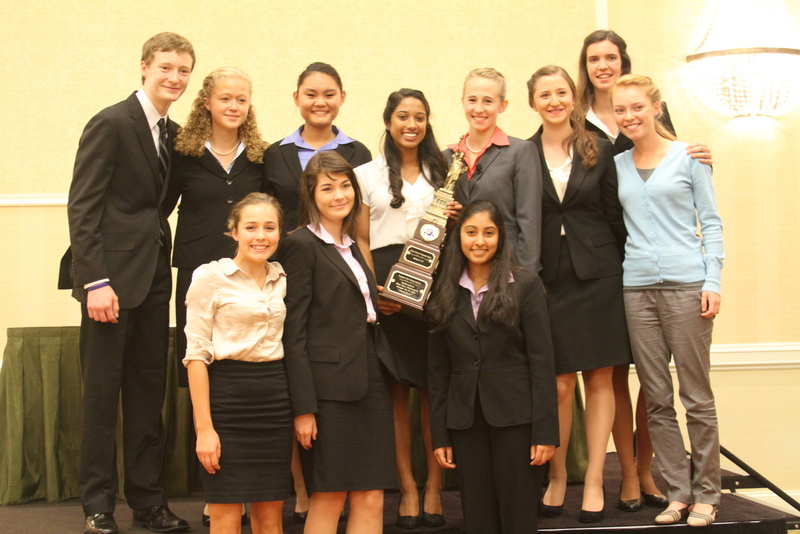 In 2012, the team was second in the state competition and second in a world-wide Invitational Tournament held in NYC. (Visit our webpage at http://www.dpmocktrial.wordpress.com for more information.) What will DP MT Summer Camp involve? It will be run by our JV Mock Trial coach, Corinne Dorais, in conjunction with several of our returning team members. You will learn: how Mock Trial works, how to analyze a case, how to develop a witness’s character, what the coaches will be looking for in September when try-outs for the team are held, and more… Sign-ups will be limited. Reserve your spot by completing the attached application and submitting your check for $125 (payable to DPHS, with a notation on the memo line, “DP MT Summer Camp”. Checks and application forms should be mailed or hand-delivered to DPHS, 7266 Alameda Ave., Goleta 93117. For more information, contact Corinne Dorais at Corinne.dorais@gmail.com. Overcoming a shortened practice season and a hard-fought challenge from its arch-rival, the Dos Pueblos Mock Trial team defended its county title by defeating San Marcos 2-0 in the 2013 Santa Barbara County Mock Trial Championship Saturday at the Santa Barbara County Courthouse. It was the fifth consecutive county championship for the Chargers who advance to the California state championship tournament March 22 in Riverside, California. In 2011, the Chargers and Royals tied for the county title. But this season the Chargers faced a unique set of challenges after an October trip to the Empire World Invitational in New York delayed their preparation for the county case by two months. “It was incredible to see how everyone pulled together as a team of both new and experienced members,” added lead prosecution attorney Alison Mally. This year’s case involved a high school senior accused of felony hit-and-run after bicyclist Cameron Douglas was hit by a car and suffered serious and permanent injuries. The case also included a pretrial argument over whether the defendant’s statements to the investigating officer should be suppressed because the officer failed to read the defendant the Miranda warning. Mally used her closing argument to poke holes in the San Marcos defense argument that their client Adrian Vega was not behind the wheel at the time of the accident and had allowed a foreign exchange student to drive her father’s expensive car. “Your honor, what the defense is asking you to believe is that the one time the defendant disobeyed her father’s order and allowed someone else to drive her father’s vintage sports car, was the few minutes that it was involved in a crime,” said Matthys. On the defense side, defense attorney Madeline Matthys emphasized the lack of physical evidence presented in trial. The Chargers had defeated Santa Ynez in the morning semifinal round to set up the showdown with the Royals. Judge Brian Hill and local attorney Steven Amerikanner presided over the two championship trials. “As Dos Publos Blue team heard they were facing off against San Marcos in the final rounds we were excited to have made it this far and, what’s more, have the chance to face an incredibly challenging and talented competitor,” said co-captain and defense attorney Hannah Cruz. Sponsored by the Constitutional Rights Foundation, mock trial teams all receive the same case packet, witness statements and facts in September, and spend hours each week preparing their arguments and exams, researching the law, and developing character for the witnesses. Local attorneys donate their time to mentor and coach the students. DP Mock Trailer 2012-13 from Dos Pueblos on Vimeo. KEYT was there when Nimisha Shinday, Madeline Matthys, Madeleine Centrella, and Hannah Cruz of DP Mock returned from NY after competing at the Empire World Invitational. Click on the photo to watch.